The piano recital by the chief conductor of the Brno Philharmonic Denis Russell Davies and his wife the pianist Maki Namekawa yesterday in Besední dům offered three works by three significant figures from American minimalism. The concert included minimalist works by Steve Reich in the shape of Piano Phase, the composition Hallelujah Junction by John Adams and Four Movements for Two Pianos by Philip Glass. For a number of years musical minimalism has been unusually popular with listeners. This trend can be taken as the clear antithesis to the extreme heritage of expressionism, dropping the period’s musical approach and setting out on its own path of short repetitive motifs branching out into broader passages of gradually changing music. The early form of musical minimalism reflected the desire of composers in the fifties and sixties for radical change not only in the composition process itself but mainly for the way music was perceived in general. A minor change in the motif, which many would have not noticed, here becomes the centrepiece of the work. The meditative, and even hypnotic character, of these works stands in contrast to the musical production of the time. As composition developed however this revolutionary approach began as a result of becoming interwoven with the original musical culture to change and develop. For many contemporary composers the original concepts of minimalism often function as a springboard that gives rise to the synthesis of several different musical styles and compositional approaches. The wisely assembled programme for Saturday’s concert tried to illustrate this compositional development chronologically with the works of the leading composers of American minimalism. Reich’s piece Piano Phase from 1967 is from what was still the early phase of American minimalism. The introductory motif drawn from a twelve-tone series is first played by one pianist and then by the other, who however after a short while imperceptibly speeds up. This then leads to a “phase shift”, which can also be found in others among Reich’s works. The concept requires an unbroken rhythmic precision from both interpreters, since the uniqueness and complexity of the musical structure arises precisely from this constant shift in both piano lines. Denis Russell Davies and his spouse Maki Namekawa have great experience with minimalist compositions and so were able to sustain the constant melodic shifts completely without difficulty. While Reich’s Piano Phase his built on an almost monotonous repetition of short musical motifs, they managed – especially Maki Namekawa – to introduce to the work elements of lyricism and personal expression. Subtle, yet noticeable in the little things, the phrasing supplied the work with a significant new musical dimension. The following work Hallelujah Junction by John Adams showed a newer face of minimalist music. In comparison with the uncompromising pulsing composition by Steve Reich it came across as much more traditional, even though it contained within itself a sharp minimalist ostinato. It was in Adams’ piece that the synthesis of the old and new musical worlds was most apparent – the stretching hypnotic musical passages alternating with unexpected melodic and harmonic twists and the dialogue between the two pianos offered space for a wide variety of compositional techniques. 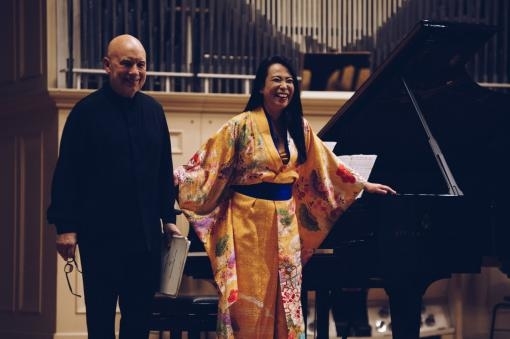 Dennis Russell Davies and Maki Namekawa brought the lyricism and toughness of the work to the surface – especially in the sudden contrast between aggressive utterances and the unexpectedly fragile and romantic entry in pianissimo which were brilliantly mastered by the pianists and were highly suggestive in their effect. Dennis Russell Davies generally chose a rather moderate approach, while Maki Namekawa went for a more exposed one. It should be added that this was what was required by her part. The closing piece of the evening was the composition by Philip Glass Four Movements for Two Pianos, which the composer wrote for the couple in 2008. Glass does not only work with so-called “classical music”, but in certain places draws inspiration from popular music. This dichotomy is clear in Four Movements for Two Pianos, where the harmonically more colourful parts swap with classical chains of cadences ending clearly on the tonic, all accompanied by arpeggios. However it would be short-sighted to assess the value of the piece only on the basis of harmonic complexity. Glass’ work despite its flirtation with popular culture remains on the territory of classical music. The listener could be convinced of the possible colour and expressive shades that can be found in Glass by the performance of Maki Namekawa. The pianist skilfully passed from jubilant runs and attacked the milder parts of the romantic lyrical, expressive interpretation changes propped up by excellent work with dynamics. Dennis Russell Davies chose, as in the preceding composition, rather a more mumble, less emotionally expressive approach, which created a pleasant contrast to the other piano part. This exceptional concert for the Chief Conductor’s Series very briefly outlined the development of American minimalism from its beginnings to more or less its current shape. However it would be wrong to think that this is the only form of musical minimalism. There also exist other more extreme musical experiments, hidden in the shadow of the better-known faces. Nevertheless, it is commendable that the Brno Philharmonic under the leadership of new chief conductor has offered this opportunity and enriches the cultural life of the city of Brno also with popular works that are rarely performed locally.